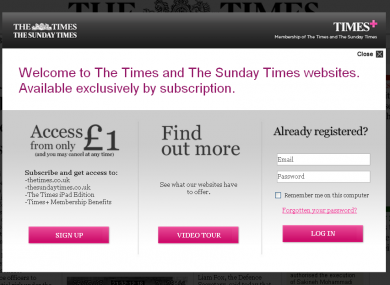 Users visiting the Times and Sunday Times' websites since July have been asked to subscribe to read their content. THE TIMES AND SUNDAY TIMES have announced that their new subscription-only websites have attracted about 105,000 paying subscribers. The newspapers became the first major UK newspapers to require users to sign up and pay to read their content online when they introduced a so-called ‘paywall’ in July of this year, and has seen its average total of unique visitors a month fall from 21 million to about 2.7 million in that time. Two million of those users had visited the Times website itself on average every month, while another 700,000 unique visitors had visited the Sunday Times website. Times editor James Harding said that aside from the 105,000 people who had paid to read the newspaper online or on their mobile phones, there were another 100,000-or-so people who had taken out joint subscriptions to read the papers both digitally and in print. We’re seeing that those people who are reading the digital editions of the Times and the Sunday Times really like them, if they sign up for a trial they tend to stick with us. We’d engaged in a quite suicidal form of economics – which was giving our journalism away for free. We knew that if we continued to do that we couldn’t invest in reporting. Our concern was would we be cut off from the ‘internet conversation’, and the truth is we haven’t been. The websites’ initial online subscription had cost £2 a week, or £9.99 a month for an iPad subscription, though the sites have since introduced a £1-for-a-month trial offer in attempts to encourage more people onto the sites. Media website BeehiveCity reported in July that there had only been 15,000 paid subscribers signing up in the first few weeks of the service, while there had been 12,500 downloads of the iPad software. Email “Times reveals readership numbers behind online paywall”. Feedback on “Times reveals readership numbers behind online paywall”.